Several month’s ago I promised to pursue a column about the life and times of legendary philatelic auction agent and literature dealer: Louis K. Robbins. A couple of weeks ago I called Lou to set up a time convenient for him to be interviewed. At age 96 he has slowed down a bit. Ever humble and never one boast about his life past, Lou turned down my request. However he did spend ten enjoyable minutes with me on the phone and gave me a few nuggets of truth about the stamp business and our hobby. After the call ended I was disappointed that I would not be able to tell Lou’s story. However, the grains of wisdom that I had gleaned from our conversation will be the bases for several columns. Sometimes taking the wrong fork in the road turns out to be the more interesting route in the long run. There you have it in two sentences the unvarnished truth about philately. The dealer represents the business or supply side of the equation, the person who makes his or her living from stamps. On the hobby or demand side you have the collector who spends years pursuing the goals established for their collection. One does not exist without the other. In the middle you have the difference or spread between the dealer’s cost and your purchase price. However for the collector there is much more to be gained above and beyond the purchase price in the “hobby of kings”. For the stamp collector the “spread” is represented by the years of learning and enjoyment that come from this intellectual pursuit. This is the interest you accrue, above your cost, over the years from pursuing your hobby. It is one of the very few hobbies’ that gives you the opportunity to recover a fair percentage of what you have spent over the years. Compare it to years spent playing golf. What will you have in the end: several sets of worn out clubs, shoes, a clothes. All of your green fees from over the years will be long gone. But as with stamp collecting you will still have the memories. If you are building a really good stamp collection merely for fi nancial gain, think again. There are far better places to sink one’s money for fi nancial rewards. Remember it is a hobby and the rewards gained from the experience are something money alone cannot buy. 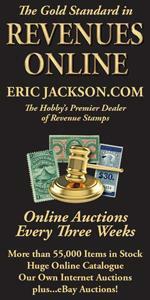 Quality U.S. stamps, fancy cancels, essays, proofs & 19th & 20th century postal history. U.S. Essay & Proof literature and auction catalogs.